Some special audio-samples from the 1995 Frankfurt Club-Life, collected by Stefan Beck. The CD shown on the right side gives an extended overview from around 1997. You'll need RealAudio to listen to these files. Sample bei Arosa 2000, Frankfurt, 19.5.1995, im Keller. bei Arosa 2000, 19.5.1995, im Keller. Sample bei Arosa 2000, 19.5.1995, im Keller. More files by special request. 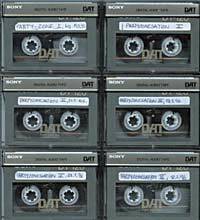 Six DAT Tapes, 12 hours, of recordings in Frankfurt clubs from 1995 and 1996. 1997 experimental CD resulting from audio recordings done in Frankfurt clubs around 1995 and 1996.